We provide a nutritious snack each morning and afternoon; and a nutritious breakfast and lunch daily. We introduce the students’ palate to various meals from around in moderation. Our menu excludes processed foods and includes fresh or frozen fruits as well as loads of vegetables; and high-quality protein sources. Parents are constantly surprised at the variety of foods that their children eat at school that they won’t even try at home. Often this is due to “positive peer pressure.” It might not happen the first time, or even the second time, but children will eventually eat foods that they see their friends enjoying. Studies have shown that children who are exposed to a variety of healthy food options at a youthful age tend to make better choices about the foods they eat as adults. We seek to educate the whole child at The Britleys by applying the Montessori philosophy, in a familyoriented environment. 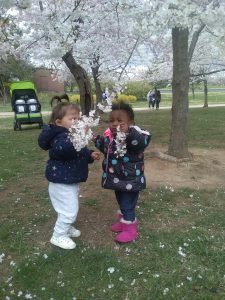 Our environment serves the particular needs of each child’s stage of development and is comprised fully of teachers who understand these stages and in turn act as guides to help our toddlers find their natural paths of development. 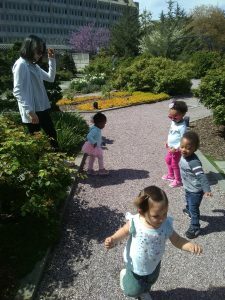 We offer yoga, music and dance, etiquette lessons, foreign languages (Spanish & Mandarin), gardening lessons, to name a few. For full details, check out our curriculum page! 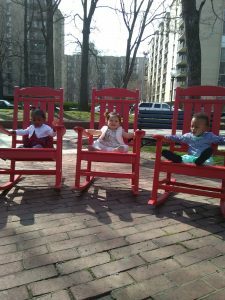 The importance of outdoor play for young children cannot be overstated. That’s why we bring learning to the great outdoors! Because of our proximity to the area attractions and museums, our students visit the museums, national mall as well as area attractions twice daily! Children are in their most impressionable stage during their early years, which is why this lesson is the cornerstone of our curriculum! 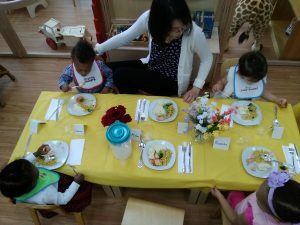 This is an ideal introductory level course for our students to learn about etiquette, social skills, and table manners. We designed the lesson to foster their growth with an ideal combination of instruction, practice, role-playing, and character building lessons specifically for them. At The Britleys, our native Spanish, English and Mandarin speaking staff work side by side. The activities are carried out naturally in the languages. English is not taught separately but rather experienced cognitively and emotionally as a lived language in a formative context. We introduce materials in English, Mandarin and Spanish. The individualized learning process that marks the Montessori method naturally lends itself to the implementation of the multilingual approach. Our teaching staff is absolutely second to none! Our dedicated teaching staff works as a team to provide the highest level of care and developmentally appropriate programs for children possible. Besides academics, each staff member is chosen for their energy, creativity, enthusiasm, and, of course, for their genuine love of children. They are required to have formal education in the field of early childhood education and/or related field. In addition, they stay current in the field by participating in at least 20 hours of continuing education each year. All our teachers are certified in First Aid and CPR, even though the District only requires us to have at least two certified people on site at all times. In addition, we have numerous staff that are trained in medication administration and the use of Epi-Pens. One of the conveniences in addition to the daily meals is our Diaper & Wipe Service. For an incredibly affordable price, we provide unlimited diapers and wipes for when your child is with us. Parents love the convenience of not having to constantly provide these to us and of not having to run out and buy them amidst their busy schedules. The wipes are latex free, hypoallergenic and alcohol free. We also place the wipes in a wipe warmer to keep them warm. The cost for both diapers and wipe is just $30/month. 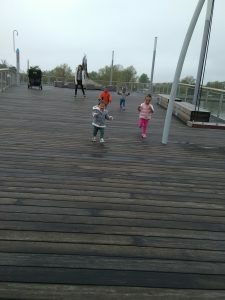 Do you know that you may have to work late a few days a week or for one reason or the other, you find yourself later than planned to pick up your child? No problem. We understand, and have you covered! We understand that things come up. We also understand that traffic can be challenging and hectic. We provide a Late Pick-up Program, which is available until 7:00 PM daily. Our school is thoroughly cleaned throughout the day and professionally cleaned during evenings and weekends. 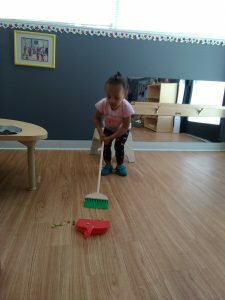 Our students put on their slippers in the mornings upon their arrival to the classrooms to maintain clean floors for them as well as to make them feel comfortable within their environment.